Team Chevy’s Will Power locked in his first-ever IndyCar championship Saturday night following a difficult 500-mile race at Auto Club Speedway. Power was second in the driver’s championship for the last three years, and was crying as he radioed a heartfelt thank you to his team after the checkered flag had flown. Power, who needed to finish sixth to claim the championship, crossed the finish line in ninth after starting 20th. 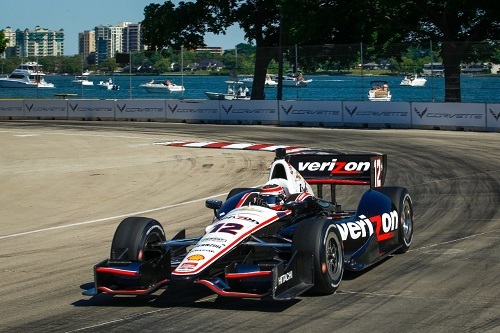 However Team Penske teammate and runner-up in the driver’s standings Helio Castroneves finished far enough behind him to give Power the win. Castroneves led the race at one point and was in seventh and still in contention for the championship when he was handed down a drive-through penalty for a pit entry violation late in the race, thwarting his chances at a win. The 33-year old Power was born in Toowoomba, Australia and began racing in the Champ Car World Series in 2005 before becoming a full time IndyCar driver in 2008. He missed winning the driver’s championship by just three points in 2012 and then only five in 2010. His improvements in racing on ovals contributed to the win this year, especially his win in early August at the Milwaukee Mile. Target Chip Ganassi Racing’s Tony Kanaan won Saturday night’s MAVTV 500, his first win of 2014 and the eleventh different winner in 18 races this year. Kanaan finished the race 3.675 seconds ahead of his teammate Scott Dixon. Ed Carpenter went on to finish third. Power’s championship win comes after Chevrolet locked in the Manufacturer’s Championship over Honda last week. The title is also the first major win from an Australian on four wheels since Alan Jones won the Formula 1 driver’s title with Williams in 1980.